Tying a Snell knot or Snelling a hook allows you to attach a tippet or leader directly to a baited hook. It can be made with braided, monofilament (including heavy mono) and fluorocarbon lines. Though it was originally meant for use with eyeless hooks it is widely used to this date with eyed, spade end, EWG, offset, octopus, treble and other types of hooks. Here the leader or line stays in line with the hook shank. According to some tests, the breaking strength of the knot has been found to be around 20 pounds with 30-pound fluorocarbon. The diagram illustrates the common or traditional way of tying the powerful knot that is just the reverse of the whip finishing knot technique. 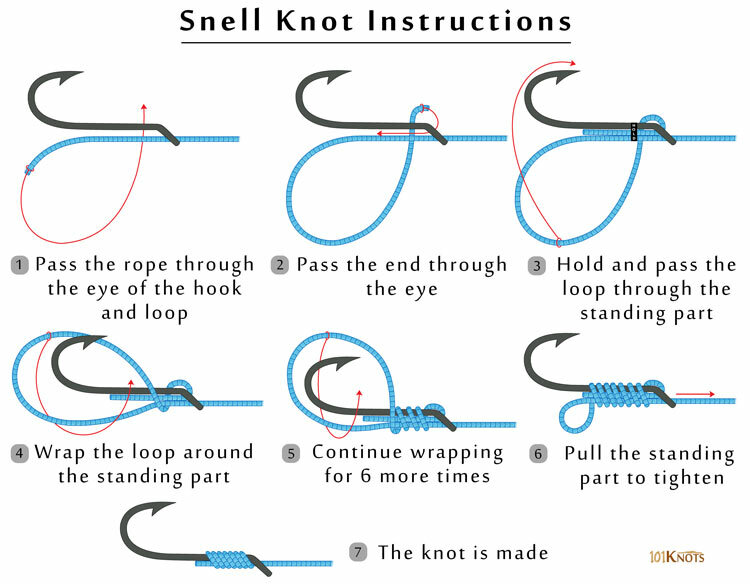 You can make an easy Snell knot by passing the end of the rope through the hook eye, wrapping it around the standing part 7 times and passing it through the last loop. Pull to tighten in the final step. This version is common when attaching circle hooks to leader lines. You can also make the knot in the uni version (uni Snell knot) by utilizing the Uni knot. It can be used for offshore hookups with live baits. You can tie it perfectly with the aid of a straw, pipe or wire held parallel to the shank of the hook. You can tie it with yarn as well as heavy leaders. You need not provide it additional support with glue. Double Snell knot- It is made by tying 2 Snell knots to 2 hooks thereby making a double Snell rig. Sliding Snell knot – This is made by tying the latter wraps along the standing part of the line itself and another line carrying one more Snelled hook. It helps in adjusting the distance between the two hooks. Egg loop knot– A modification of the Snell knot in which the wraps are made before passing the end through the eye for the second time. Improved (new) Snell knot – More reliable. 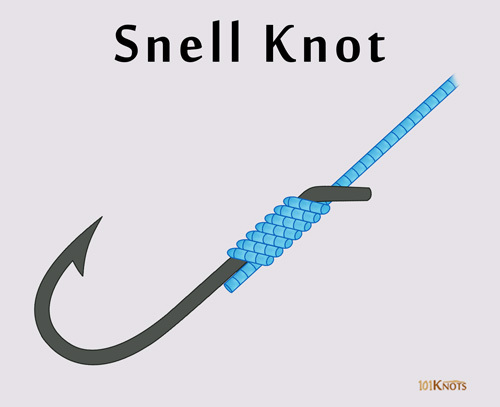 Nail Snell knot – It uses the Nail knot. The simple knot is regarded as the strongest hook to line connection due to its ability to distribute friction evenly along the system. Does not slip or come loose easily. Difficult to learn. Needs ample practice. It may break with fish having sharp teeth. Improved clinch knot – It cannot prevent spinning of the bait or any other movements that may go against the bottom current, unlike the Snell knot. Knotless knot – Better suited for hair rigs. Nail knot – Cannot be tied with all types of hooks. Palomar knot – Some experts claim this to be stronger. Uni knot – Is not tied along the hook shank. Good for fishing bass, carp, saltwater flies and catfish. For drop shots, crawler harnesses, Texas and Snapper rigs and punching heavy cover. It can tie the best chod rigs.